While electricity is something that many homeowners take for granted, you might be surprised at just how many residences in the U.S. don't have power. Whether it's a home that was foreclosed and left unkempt or a home that sustained electrical damage that was never repaired, homes lack electricity for a variety of reasons. But being that electricity is so crucial to everything from accessing the Internet to charging your cell phone, having power is a necessity for the majority of American households. And when a home has been without power for an extended period of time, there is only so much that the electrical companies can do. That's why you'll need a licensed electrician to get your home back up and running. Why do I need an electrician? When a home has been without power beyond just that of a typical, routine outage, several factors may be at play and a licensed electrician should inspect the electrical service. * The main electrical panel may have gone bad. * Wires may be dislodged or damaged. * The circuit breakers may not be in good working condition. * The main wire coming into the home may not be in good working condition. Whatever the reason, these issues aren't easy for even a handy homeowner to resolve on their own, especially when you consider the danger of electricity. What is more is that restoring power to a foreclosed or vacant home may require certain aspects of the electrical system to be brought up to code to ensure safe occupancy. This is not something that an individual can do on their own. 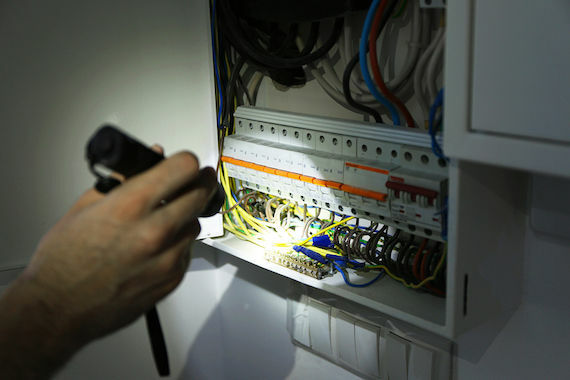 Contact First Class Electrical today if you are in need of home power restoration. Our professional, certified technicians will quickly and efficiently diagnose the issue to get you back up and running, while handling any permits and paperwork required by the city or township. Contact us today to schedule an appointment and restore power to your home.